innisfree: #MyPalette is better than yours | Manda. Wrote about this once and am writing about it again because they've made my life so much more convenient! 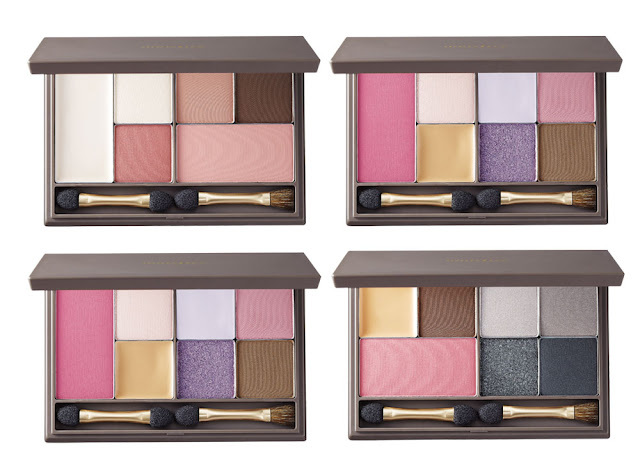 - innisfree's new customizable palettes are the bomb. If you have a sunkissed-slash-peachy skin tone like me (as they call it, the "Warm Mutes"), you'll do great with the first palette especially because the colours blend so naturally. The eyeshadows (peach tones) give a soft gradient wash over your lids and the highlight (white rectangle pan). It's perfect if you need a day makeup touch up. I didn't get to pick my palette because it was gifted with complements from the brand, but I think they did a spectacular job determining my skin tone. I got the top left palette in the photo below. The My Palette series comes in 3 sizes, S, M and L.
In my opinion, I think the Small is great for everyday usage. Especially for ladies who carry small handbags and can't fit your 100 makeup kits for mid day touch up - this is soo for you. You can't put these lippie sticks into the palette but they sure go very well with the set. They glide along your lips very easily. They're good for ladies with dry It's more of lip gloss than a lip stain. And I just need to give a huge shout out to innisfree brushes too. I've been wanting to replace my brushes for the LONGEST TIME and thank God they let me try these because I'm sold. If you haven't tried them, I implore you - go. They're soooo soft *insert crying emoji*. My face has never felt so loved (see photo below). You really don't know the literal pain of having to be jabbed by brushes with hard bristles. You can thank me later.